When have decided to choose the Twitch for the better live streaming game for that we have to give the ever best Twitch tools. Twitch has millions of monthly users. All these people watch the live streaming of video games on Twitch. What streamers need to live stream PC or video games on Twitch? They, of course, need a computer, a Twitch account and streaming software. Some very useful tools can be used with Twitch. This is a tool that tracks the donations. 26 different currencies can be received and it also offers fraud prevention features. This is streaming software for broadcasters to make professional looking broadcasts. This is an alert system that is web-based. It also offers Stream Labels windows program. This is a broadcast studio that allows streaming in minutes and there is no need to have technical knowledge to use this. This is an easy solution for tracking the donations. Donation Tracer is free to use. This tool provides statistics and analytics of the game streaming. This is a streaming site. This is a tool for social broadcasting. This is a site where it is possible to create monthly payment custom tiers. Open broadcasting software is open source free software that is very easy to use. Many useful plug-in are available in the software program. This is an overlay service for Twitch and this is web based. This is similar to open broadcasting software but is a paid product. Free version is also available but the user will only be able access it with some restrictions. This is a bot which is cloud hosted. This is streaming software for PCs with some interesting capabilities. This is a platform that helps the Twitch streamers to engage with the viewers in chat. This is a streaming service that can be used for the job. This is a perk deliver and fan funding platform for Twitch streamers. This is a PC capture software that can be used for Twitch streaming. This is with new features and more. This is a chat bot with many features and is controlled through chat. This is a old bot but is a good bot to use. It offers social features such as song requests. This is free to use. The first public bot to feature a system for screen animations and sounds chat commands. This is a desktop program bot. This is also a bot and is a web server based one. This Nightbot alike bot offers social feature. This responds quickly but is a paid bot. This is also a bot but is not much recommended. This is a chatbot with many features. This is a free bot and is very easy to use. If you know the function of Nightbot, it is easy to use WinterBot as both are more or less similar. This is a video editing tool and also video creation and sharing platform. This Twitch enhancement suite offers emotes and many new features. This is an extension that helps see check a streamer has gone live or not. Want to customize Twitch chat window? Use Chatty Java based program to change the font type and size of Twitch chat window. This is an open broadcaster software. This overlay offers Twitch solutions and professional graphics. This is a plug-in tool to display functions such as time counters. This allows watching Twitch from desktop instead of Twitch web. This is an open source IRC chat client. Great customization is offered by this for Twitch. This is a program that reduces volume of gameplay when the speaker is using the microphone. Audio streams can be transferred between devices and applications using this. Manage the audio with this tool and set volumes based on room requirements. This easy to install plug-in is must have as it offers customs emoticons, message highlighting, night mode etc. This is a video platform and is an open source platform with rich features for video editing. Want to know the stream information? Use the AnalysticBot. This is an IRC tool for Twitch. This is also a bot and its function is similar to Xanbot. This is bot used for playing VOD approved music. This is another web based program that is offered for free and is easy to use. It offers many features for editing and uploading the video. Is a social bot. This has built in chat client and offers features such as follower alert and donation alert. This is a platform to get tips, alerts and Analytics for Twitch. 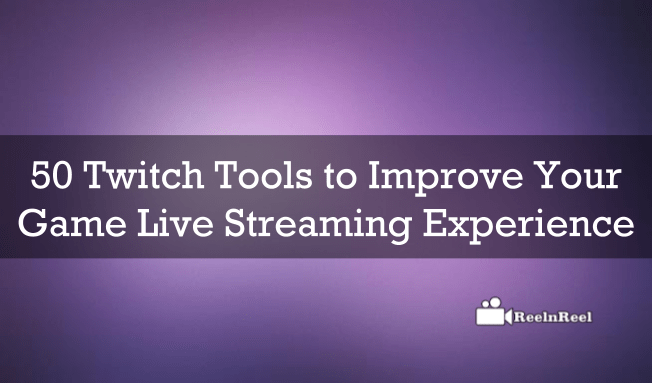 Above tools are only a few of the many tools available to make the Twitch live stream perfect. The Twitch streaming can be made better by making use of these tools.